One of my favorite photos of Jane & David on their summer wedding day by the Brooklyn Bridge in New York City. How did this happen and what are they laughing about? I dont actually know what she said to David but this is how it started and what led to this unforgettable telling photo. We asked David to stand in front of Jane and then asked her without him knowing to come up to him and tell him something really dirty. 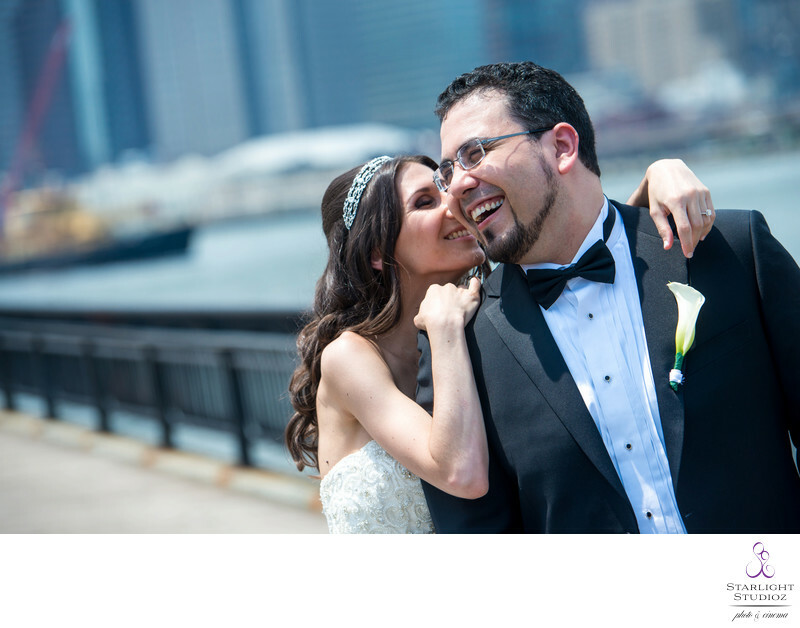 Why you ask because we wanted to make them laugh and get them out of their comfort zone and just have fun, this is what makes us different than other lifestyle wedding photographers in NY. We set up the moment but then let it tell itself and be all about them. In this photo of this happy photo you would even think there was a photographer capturing this moment. its so interesting that you just never know what and how this scene can play out. Because every couple is different and has a different story to tell and completely different chemistry amongst them. We love shooting as a lifestyle photographers for that reason its real and when our couple Jane and David look back at this photo they will laugh, im sure of it because they will both remember the reason they laughed. Love, laughter and happily ever after.